Alolan Diglett in game: 2,630 Who? Important notice! Pokemon Alolan Diglett is a fictional character of humans. Diglett (Japanese: ディグダ Digda) is a Ground-type Pokémon introduced in Generation I. It evolves into Dugtrio starting at level 26. In Alola, Diglett has a regional variant that is Ground/Steel. It evolves into Alolan Dugtrio starting at level 26. 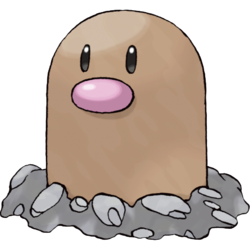 Diglett is a tiny, brown Pokémon that seems to be perpetually buried within the earth, leaving only its head visible. Its small stature makes it both the lightest and shortest Ground-type Pokémon. It has beady black eyes and a large, round, pink nose. 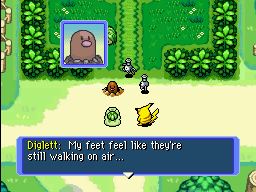 A Diglett in Pokémon Mystery Dungeon: Red Rescue Team and Blue Rescue Team mentions that it has feet, though their size and appearance are unknown. It spends much of its time underground, and has very thin skin. If Diglett is exposed to sunlight, its blood will heat up and cause it to grow weak. Diglett digs regularly through the earth at a shallow depth, leaving perfectly tilled soil in its wake. Diglett lives in tunnels and caves under the earth, where it feeds on tree roots. It also sometimes lives in burrows near forests, and has even been shown to live inside of trees. For a brief time, Fissure was its signature move. Due to volcanic activity of the Alola region, the Diglett there developed fine gold hairs on its head for protection. Diglett is able to move these hairs to communicate their feelings to others without having to stick their heads out of the ground. Diglett first appeared in Dig Those Diglett!. They were causing trouble for a construction crew that was planning on building a dam. The foreman insisted that the Diglett were to be exterminated, but the Pokémon of the Trainers that happened to be in the area refused to fight them. The reason was that the Diglett and Dugtrio were helping to plant trees in the forest. Diglett were also used by a man named Poncho in The Underground Round-Up. He used them to dig tunnels underground of a town that was infested with Electrode. The tunnels sent the Electrode to an open field where they'd live in peace. Poncho also had a Diglett inside his hat. Diglett were also featured in Plant It Now...Diglett Later, helping villagers with crops and being the apparent target of some thieves. Diglett appear in the Pokémon Mystery Dungeon: Explorers of Time & Darkness special as members of the Wigglytuff's Guild. They sound the alarm whenever intruders step into the Guild. Three Diglett appeared in Making Friends and Influencing Villains!. A Diglett briefly appeared in Lights, Camera, Quack-tion. Diglett also appeared in Pallet Party Panic, at a party among other Pokémon. A pink Diglett appeared in In the Pink, residing on the Pinkan Island. Multiple Diglett were seen at Professor Oak's Laboratory in The Rivalry Revival. Diglett made an appearance in Tanks a Lot!. Several Diglett protected an Apricorn tree against Team Rocket in Going Apricorn!. Two Diglett were seen in the wild in The Legend of Thunder!. A Diglett appeared in a fantasy in Gone Corphishin'. A Diglett also appeared in Pinch Healing! as one of the wild Pokémon in the forest. A Diglett is owned by one of the students of Snowpoint Trainers' School in Classroom Training!. A group of Diglett appeared in A Rivalry to Gible On!. A Diglett appeared in The Dream Continues!. Two Diglett appeared in a flashback/fantasy in The Forest Champion!. A Diglett appeared in Pikachu and the Pokémon Music Squad. A Diglett appeared in A Watershed Moment! in a flashback. EP031 Diglett Ash's Pokédex Diglett. The movement of these Ground Pokémon can be easily detected by their tracks of upturned earth. EP114 Diglett Ash's Pokédex Diglett, the Mole Pokémon. Diglett love to compose underground tunnels. Diglett appeared in Celebi: a Timeless Encounter. Diglett makes a cameo in the Red, Green & Blue chapter in Raging Rhydon as a wild Pokémon in Mt. Moon. Red also owns a Diglett that he caught offscreen in A Tale of Ninetales. He uses it against a wild Eevee in Blame It on Eevee, but it was quickly defeated when Eevee evolved into Vaporeon. A group of wild Diglett appeared in Can You Diglett? where they were seen crossing the tunnel Bruno's Onix made when he battled Red, some of them then evolved into Dugtrio. A Diglett is seen as one of the Pokémon at Earl's Pokémon Academy in Violet City in Slugging It Out With Slugma. Pearl owns a Diglett called Digler that was caught to fill his team with six Pokémon. He first appeared in Cleaning Up Grimer. A Diglett participated in a baseball match in Fierce Competition at the Pokémon Baseball Tournament!. A Diglett is seen with Red during the curry cooking competition that went on in Curry Showdown! Which is the Most Delicious?. Giovanni was shown to have seven Diglett. He sent them out to prevent anyone from winning the contest he hosted on TV. Many Diglett have made minor appearances during Red's travels. Ruby has a Diglett at his house as seen in Something Happened!! Let's Go After Pikachu!!. Shū has a Diglett in the Pokémon Gotta Catch 'Em All manga. Pokémon Pinball: Numerous Diglett appear in a bonus stage accessible from the Red Table, where the aim is to knock all the Diglett out. Once achieved a Dugtrio appears which must then be knocked out. More Diglett appear on the Red Table itself and earn the player points upon being hit. Pokémon Mystery Dungeon: Red Rescue Team and Blue Rescue Team: The third story mission of the game is to rescue a Diglett from Mt. Steel. Afterwards, Diglett can be found near Pelipper Post Office. Diglett's hero is its father, Dugtrio, who it thinks can do anything. Pokémon Mystery Dungeon: Explorers of Time and Explorers of Darkness: Diglett is one of the members of Wigglytuff Guild. His primary role is sentry duty, to examine visitors' footprints and say what Pokémon they are. Like in the first game, Diglett also has a father who it thinks can swim in the sea. Lives about one yard underground where it feeds on plant roots. It sometimes appears above ground. It prefers dark places. It spends most of its time underground, though it may pop up in caves. Its head pokes up approximately eight inches out of the ground. However, its real size remains a mystery to this day. Its skin is very thin. If it is exposed to light, its blood heats up, causing it to grow weak. 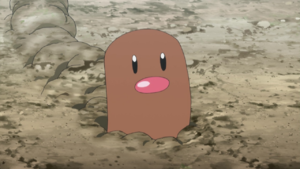 If a Diglett digs through a field, it leaves the soil perfectly tilled and ideal for planting crops. It digs underground and chews on tree roots, sticking its head out only when the sun isn't bright. Diglett are raised in most farms. The reason is simple - wherever this Pokémon burrows, the soil is left perfectly tilled for planting crops. This soil is made ideal for growing delicious vegetables. Diglett are raised in most farms. The reason is simple — wherever they burrow, the soil is left perfectly tilled for growing delicious crops. A Pokémon that lives underground. Because of its dark habitat, it is repelled by bright sunlight. Diglett are raised in most farms. The reason is simple—wherever this Pokémon burrows, the soil is left perfectly tilled for planting crops. This soil is made ideal for growing delicious vegetables. It chews on plant roots underground. Farmers whose vegetables are vulnerable find it can be quite a pest. Many farmers cherish and nurture Diglett because its droppings enrich the soil it lives in. Its golden hairs function as sensors. It pokes them out of its burrow to monitor its surroundings. Moves marked with a superscript game abbreviation can only be bred onto Diglett in that game. 51%-100% HP Please don't whack me on the head! 26%-50% HP My health is down to half. 1%-25% HP I can't keep going... Can I burrow out of this? Level up Oh, wow! I must have leveled up! Diglett burrows about underground. It sometimes rests with its head poking out. Diglett cunningly moved the Mine Cart Rail hidden inside the Berry Storage in the Cavern Zone and placed it under Snorlax. He is shy and hides quickly, but he actually wants to become friends with everyone in PokéPark. For other sprites and images, please see Diglett images on the Bulbagarden Archives. In the Pokémon Red and Blue beta, Diglett was originally to use its Japanese name, "Digda", as its English name. This name was retained in the German localization of the games. Diglett has the second lowest base HP of any Pokémon, after Shedinja. It also has the lowest base Defense of any Ground-type Pokémon. In Pokémon Mystery Dungeon: Red Rescue Team and Blue Rescue Team, after the first Mt. Steel mission, Diglett mentions having feet. It is mentioned again as being one of the seven mysteries of Pokémon in a letter, alongside Arbok's pattern changes and the inside of Forretress's shell. Diglett and its evolved form share their category with Drilbur. They are all known as the Mole Pokémon. Diglett, despite being one of the smallest and lightest Pokémon, has the ability to breed with Wailord, the Pokémon with the greatest height. This is similar to HSOWA. In the Pokéathlon Hurdle Dash, Diglett and Dugtrio are seen to go underground rather than physically jump out of the ground. Since Generation V, when Diglett and Dugtrio are sent out, they merely fade onto the screen instead of dropping down like all other Pokémon. In the Poké Transfer, Diglett and Dugtrio run between bushes rather than jump. In Pokémon HeartGold and SoulSilver, if Diglett is the player's partner Pokémon, and the player goes to the Pokémon Center, Diglett jumps to its Poké Ball to be healed. In the anime, Gary has stated that Diglett is able to pull its head underground at the speed of light. Diglett is listed in Pokémon Stadium as having Acid as a valid move, despite not being able to learn the move. 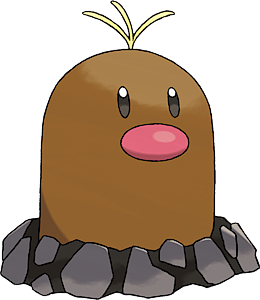 Diglett appears to be very similar to the artificial moles used in Whac-A-Mole arcade games, as referenced by its full health phrase in Pokémon Mystery Dungeon: Red Rescue Team and Blue Rescue Team. There is also some similarity to worms. Alolan Digett's hair may be based on Pele's hair, a thin volcanic glass formed near Hawaiʻi volcanoes. Diglett may be a combination of dig and singlet. Digda refers to the word dig.